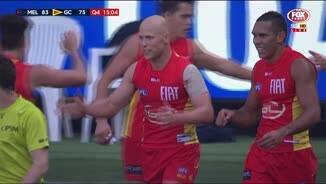 Ablett scores two quick goals to get the Suns within striking distance. Four debutants have kicked a goal today. For Melbourne, Aaron van den Berg (1.2) and Jesse Hogan (2.2). For Gold Coast, Touk Miller (1.1) and Adam Saad (1.0). Melbourne averaged 8.6 goals per game in season 2014. Christian Salem's first goal is their 17th of the game. Ten of the 16 goals Melbourne has kicked today have come from Gold Coast turnovers. The two players selected with mini draft selections in 2012 lead the game in contested marks. 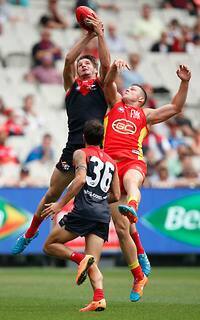 Jesse Hogan (Melbourne) has a gamehigh four, while Jack Martin has three for Gold Coast. Despite enjoying an advantage in disposals (4836), clearances (5-1) and inside 50s (9-6), Gold Coast have only outscored Melbourne by seven points this quarter. Gary Ablett leads all players with 16 contested possessions. Jeff Garlett leads the Demons with 11. 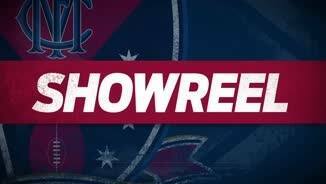 Melbourne InterchangeJimmy Toumpas was substituted into the game for Angus Brayshaw. 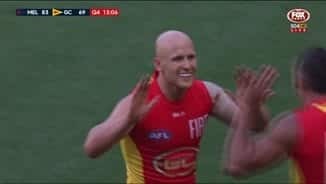 Gold Coast with the last four inside 50s, Gary Ablett with two goals in 92 seconds. 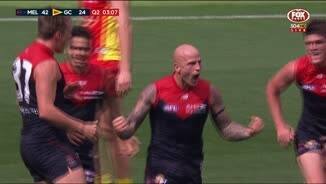 Nathan Jones (Melbourne) the first player to break 20 disposals. He also has six tackles, four inside 50s, two clearances and one goal. Suns InterchangeNick Malceski off due to an injury. Demons InterchangeDean Kent off due to an injury. Suns InterchangeMitch Hallahan off due to an injury. Demons InterchangeDean Kent off due to a concussion. Demons InterchangeDean Kent off due to the blood rule. 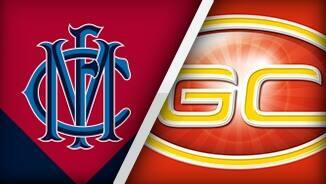 Welcome to MCG for the Melbourne v Gold Coast Suns Round 1 clash. MELBOURNE has ended a 10-year round one drought, playing with spirit and hardness to beat Gold Coast by 26 points at the MCG on Saturday afternoon. In capturing their first opening round win since 2005, the new-look Demons weathered three separate rallies from the Suns to win 17.13 (115) to 13.11 (89). The club's great hope for the future, Jesse Hogan, iced the game with a composed set shot, while fellow debutants Aaron vandenBerg and Angus Brayshaw impressed in a memorable day for the faithful. The Demons ruined Gary Ablett's return to football, with the Gold Coast superstar appearing below full fitness after an off-season spent working back from shoulder surgery. 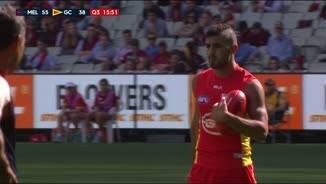 The Suns' captain, who finished with 19 possessions, tried to turn the game for his team in the final term, kicking brilliant back-to-back goals and cutting the margin to eight points. 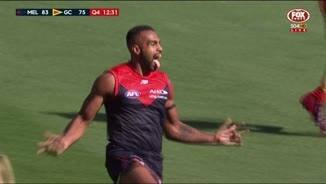 However, the Demons showcased their newfound hardness and composure, with recruit Heritier Lumumba and Jack Watts, who played one of his best games for the club, responding with clutch goals. Hogan, who finished with two goals and seven marks, then sealed the game and took the Demons to their first 100-plus score since round 14, 2013, against the Western Bulldogs. 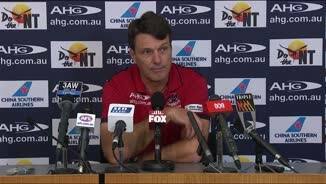 "Being challenged three times, this footy club has been challenged a lot and the results haven't been great when that's happened," coach Paul Roos said after the game. "Getting challenged in the second quarter, third quarter, fourth quarter and having the guys respond out on the ground … it was certainly a good day for the club." Recruit Jeff Garlett was outstanding for the victors, kicking 2.4 and adding dash to the midfield when pushing up the ground. Ruckman Mark Jamar (29 hit-outs) combined brilliantly with inspirational captain Nathan Jones, who led the midfield superbly with 25 possessions, six tackles and five inside 50s. The Demons out-tackled their opponents (66-53) and played at an intensity not seen for a long time, preventing the Suns’ half-backs – including All Australian Nick Malceski – from setting up play. 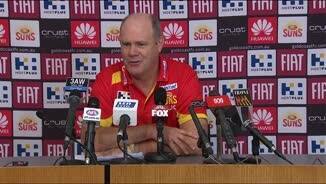 It was a tough day for new Gold Coast coach Rodney Eade, who was in charge of a senior team for the first time since 2011. "We were outworked today and it was the difference in the end," Eade said. "It's not an easy statement, but a lot of them didn't seem as if they'd turned up. Maybe they thought it was just going to happen, I'm not too sure. "Dealing with footballer sometimes is a bit worse than dealing with racehorses." 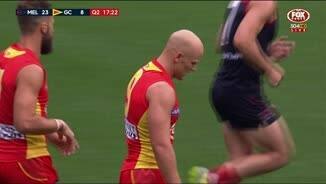 The Suns could lose Matt Shaw, reported for rough conduct on Dean Kent in the first five minutes, running back with the flight and cannoning into his opponent in a marking contest. Young star Jaeger O'Meara was also taken from a NEAFL match in Coorparoo on a stretcher after dislocating his right kneecap. Melbourne midfielder Jack Viney set the tone for Saturday's tough performance in the opening minutes when he ruthlessly tackled Ablett into the ground. Brayshaw, who laid nine tackles before he was substituted early in the fourth quarter, also added hardness to the Dees’ midfield in his debut. When they had the ball, the Demons played with adventure, regularly using the corridor and turning turnovers into goals with rapid counter-attack. 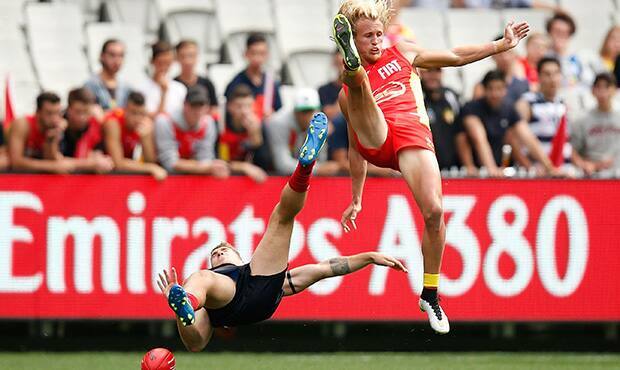 Gold Coast midfielders Dion Prestia (29 possessions and eight clearances) and Michael Rischitelli (21 and two goals) battled hard for the Suns, who lacked structure and direction going into their forward line.